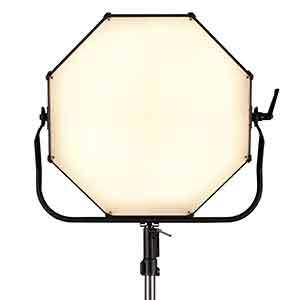 The Space Light has become one of those universally used fixtures which inhabit many film sound stages, as well as finding employment within studio-based broadcast productions. Its history, not completely lost in the sands of time, is very much part of the evolution of the British film industry, whilst its use extends now to Hollywood and beyond. For the uninitiated, the Space Light is of a circular construction, and consists of 6 lamp holders, each of which accept a 1kW / 800 Watt double-ended lamp. Most often manufactured in-house by the larger rental companies, over time there have also been versions produced by companies such as FilmGear and Mole-Richardson. The large current required to power the fixture is supplied via multicore cable usually terminated in Socapex connectors. The supply is then run back through conventional dimmer packs, to provide control. With a diameter of some 60cm and a depth of about 120cm, a 'Silk' resembling a large baked bean can in shape is hung beneath, with a 'target' at its base. The whole construction has a mounting ring at its top to affix it to the lamp, and is made from heat-resistant diffusion material. Most often a 'Black Skirt' is then hung around the outside of the 'Silk' so that the only illumination provided is from its base in a downward direction. Traditionally hung in a grid formation above a set by chains or wires, the purpose of the Space Light is to provide ambient soft illumination. Originally the level of illumination was set to give an even Stop across the floor, at a level sufficient to ensure proper exposure of the film stock in use, particularly in the mid-tones. This left the more specific lighting on the floor to create additional light and shade as required. To return to the history lesson, it is believed to be the brothers John and Benny Lee of Lee Lighting fame that originally devised the concept of the 'Space Light'. For its execution, the idea was then passed to one of the industries' unsung heroes, Bill Chitty. Born in Walton-on-Thames Surrey in 1924 (where he lived all his life), Bill started his career with an engineering company, where he received the grounding in metalwork skills that he would put to good use later in life. After a brief spell in the RAF towards the end of the War, he found employment as an electrician at Shepperton Studios, then later a Gaffer. In his time he worked on such notable productions as The African Queen with Humphrey Bogart, with whom he reportedly played cricket on the back lot. Bill had a passion for working within the industry which led him to assume the role of Engineering Manager at Lee Lighting. It was here that he really made his mark, capitalising on the skills which he had gained working in engineering and then working within film production. With responsibility for maintaining the inventory of a large rental company, he was also instrumental in building a number of fixtures which are still in common use today. In addition to the Space Light, another notable example was the Wendy Light. Built to overcome the issue of light fall-off, dictated by inverse square law, the fixture was created at the behest of David 'Wendy' Watkins. Watkins, best known for films such as Out of Africa (for which he won an academy award), wanted a means of filming actors traversing a scene in moonlight with constant illumination, without resorting to hiding lights at points along their travel. Chitty built a large array of Fay lights for him, which could be slung from a crane at a quarter mile distance, to produce the effect of moonlight. A ferocious fixture by any standards, full Wendy Lights (still very much in use today) can draw anything up to 124kW of power. And there-in lies - probably - the most significant drawback with both the Wendy Light and the ubiquitous Space Light. Given our awakening to the stresses placed on the planet through use of resource- hungry devices, the significant power draw and consequential heat produced by traditional fixtures, have led the world of image capture to seek more efficient means of achieving the same end. As an example of the profligate nature in which large numbers of Space Lights can consume resources, one major film franchise utilised some 1,600 to light a single stage. Powered by Diesel generator sets, the fuel bill on a weekly basis was some $60,000. Consequently over time the Space Light has become something of a 'Holy Grail' for replication using less resource-hungry technologies, such as LED. To the manufacturer with a comprehensive understanding of the technology, this is now an achievable goal. One such example is the Space Force from LED lighting specialists, Chroma-Q. Bill Chitty's creation holds within, however, a number of characteristics which until recently, have been hard to emulate. To produce a comparable volume of light to that of a 6kW Space Light in black skirt, and a target at its base, requires a significant number of LEDs. This then compounds further issues which put potential replacements at odds with the original design. To remove the heat from a large number of LEDs, such that they don't fail prematurely, or experience colour shift because of a varying temperature gradient, can require active cooling by way of fans, and significant heat-sinking. Both of these elements can add unwelcome attributes, namely noise and weight. A traditional Space Light is silent running and weighs in (with Silk, Skirt and Target) at around 12kg. Chroma-Q's Space Force is one of the first 'replacements' to truly match, in terms of volume of light produced, an incandescent Space Light (with Silk and Skirt on), whilst retaining those vital characteristics - with the added benefit of significantly reduced power draw. Passively cooled without the use of fans, the Space Force runs virtually silent. In addition it weighs a diminutive 8kg, so is indeed lighter than a fully rigged Space Light. So here perhaps we are neck and neck comparing new technology versus old technology. At which point we introduce one of the Chroma-Q Space Force's strongest characteristics. One of the 'tricks' often employed on large film sets is to gel the fixtures extending into the background, with blue. This creates the illusion on film of colour depth within the frame, a recreation of the real world effect of UV (short wavelength) light in the spectrum, which can make the view into the distance appear increasingly blue. This is not without its issues, however, as it necessitates applying gel to each fixture individually from a cherry picker, which is both time consuming and not without cost. In this instance, via DMX control (and if required using a wireless link), the Space Force's colour can be tuned remotely - in an instant between 2,800K - 6,500K. With a more organic shape that resembles a traditional Space Light, as opposed to the more common rectangular form which many LED sources take, the Space Light is not just confined to use as a top-source. Mounted in a yoke, it can be deployed with a number of accessories in varying situations, which is perhaps where it really scores over a Space Light. A more versatile fixture, it provides a solution to a multitude of other potential lighting problems. Would Bill Chitty have been impressed with the Space Force? The obvious level of development and engineering would, one hopes, have elicited a resounding 'Yes'. He was by all accounts a good bloke.